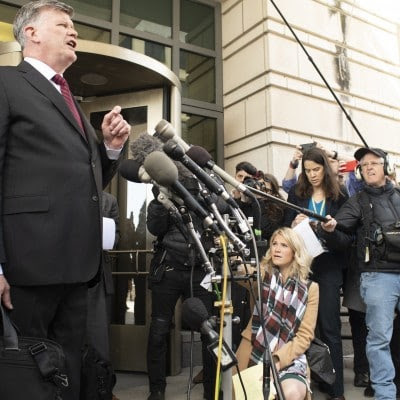 WASHINGTON — In the final moments before Paul Manafort’s sentencing Wednesday, the former Trump campaign chief’s lawyers appealed for mercy — but not necessarily from the judge. U.S. District Judge Amy Berman Jackson cut him off. “Whose political motivation?” she asked. Downing fumbled like Sarah Palin replying to Katie Couric: “Everybody out there,” he said. The judge pressed: Was Downing accusing the special counsel of political motivation? But that is exactly what he — and Manafort — have been insinuating. President Trump and Manafort have been using their public statements to coordinate with each other with the rhythm of synchronized swimmers. Trump praises Manafort for not flipping on him, and Manafort’s lawyers dutifully repeat Trump’s mantras — that there was “no collusion” between the campaign and Russia and that special counsel Robert S. Mueller III has taken a partisan detour. It’s clear Manafort’s hope, if not expectation, is for Trump to pardon him. The judge was wise to the signaling. After Downing suggested Wednesday that Manafort’s manifold crimes wouldn’t have been prosecuted “but for a short stint as a campaign manager in a presidential election,” Jackson unloaded on him. Jackson tore into the Manafort defense’s claim that Mueller’s team took a technical violation and “transmogrified it” into a major case. “To the extent that’s the correct word, it was the defendant who was the transmogrifier,” she said. As for the other claim frequently offered by Manafort’s defense, “the ‘no collusion’ mantra is simply a non sequitur,” she said, adding that it is “not clear if it is accurate” and that her ruling doesn’t vindicate or incriminate anyone in Mueller’s broader investigation. Based on the sighs I heard in the courtroom, Jackson’s sentence — adding 43 months to last week’s 47-month sentence in Virginia — disappointed prosecutors. But she displayed far more professionalism than Judge T.S. Ellis III, who, when his harassment of prosecutors during the Virginia trial didn’t sway jurors to acquit Manafort, gave a flagrantly light sentence. Manafort’s fate still depends both on further prosecution (New York state just announced indictments) and Trump’s possible pardon. The defense claimed, with some contradiction, that Manafort deserved leniency both because he accepts responsibility and because he maintains he didn’t play a “leadership role” in the crimes. If restrained in her sentencing, the judge was liberal in criticism. She said “it’s hard to overstate the number of lies” and the “amount of fraud” Manafort committed, living extravagantly on ill-gotten money, lying to members of Congress and the public, showing “ongoing contempt” for court proceedings and even mischaracterizing his prison conditions. Manafort stood briefly, then was wheeled away — to await relief from another man who dissembles at every turn, exercises no personal responsibility, shows contempt for the law and seeks to win at all costs.